RECEPTION HALL 16′ 0" x 6′ 6" (4.88m x 2.00m) With Oak flooring, spot lighting to coved ceiling, power points. GROUND FLOOR CLOAKROOM 6′ 8" x 2′ 5" (2.04m x 0.75m) With pedestal wash hand basin, low flush w.c., single panel radiator. LOUNGE 12′ 6" x 11′ 5" (3.83m x 3.50m into Bay) With coved ceiling, two radiators, power points, feature fireplace with a living flame gas fire, two double glazed windows to the side of the property and double glazed French Doors giving access onto a rear Decking Area. 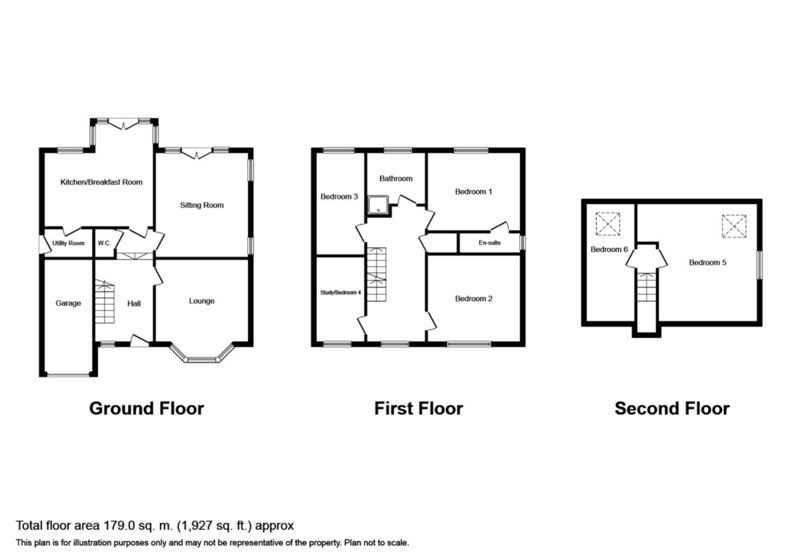 SITTING ROOM 16′ 9" x 12′ 5" (5.11m x 3.81m) With radiator, Oak flooring, power points, coved ceiling and double glazed window giving aspect over the front. KITCHEN/BREAKFAST AREA 16′ 9" x 16′ 1" (5.12m max x 4.92m) Having a comprehensive range of fitted units comprising wall cupboards, worktop surface with splash back and a range of base units beneath, one and a quarter bowl sink, built in dishwasher with matching front décor panel, free standing ‘New World’ electric oven with five gas ring burner, extractor hood over. Power points, radiator, double glazed window giving aspect over the rear, spot lighting to ceiling and double glazed French Doors giving access onto the rear decking area. UTILITY 9′ 1" x 4′ 9" (2.77m x 1.46m) With a continuation of the tiled floor, storage cupboards, worktop surface over, single drainer stainless steel sink with mixer tap over, plumbing for automatic washing machine, power points, boiler serving the domestic hot water and heating system, uPVC Double Glazed door to side elevation. LANDING 18′ 5" x 6′ 7" (5.62m x 2.01m) Coved ceiling, power points, radiator, large airing cupboard with radiator, double glazed window over looking the front. BEDROOM ONE 12′ 6" x 12′ 6" (3.82m x 3.82m) With radiator, power points, fitted wardrobes with mirror sliding doors, double glazed window giving aspect over the rear. ENSUITE 5′ 9" x 3′ 9" (1.77m x 1.15m) Having a three piece suite comprising wash basin with tiled splash back, low flush w.c., purpose built shower cubicle, chrome heated towel rail. BEDROOM TWO 12′ 6" x 10′ 7" (3.82m x 3.23m) With radiator, power points, double glazed window giving aspect over the front. BEDROOM THREE 14′ 7" x 9′ 1" (4.47m x 2.79m) With radiator, power points, double glazed window giving aspect over the rear enjoying superb views. BATHROOM 8′ 1" x 6′ 6" (2.47m average x 2.00m) Having a four piece suite comprising panelled bath, low flush w.c., pedestal wash hand basin, purpose built shower cubicle, part tiled walls and chrome heated towel rail. BEDROOM FOUR/STUDY 12′ 0" x 9′ 0" (3.66m x 2.76m) With radiator, power points and double glazed window giving aspect over the front. BEDROOM FIVE 16′ 3" x 15′ 8" (4.96m x 4.80m) With radiator, power points and double glazed velux window. BEDROOM SIX 16′ 2" x 9′ 1" (4.95m x 2.79m) With radiator, power points, double glazed velux window and double glazed window over looking the side of the property. OUTSIDE The property is approached over a shared access onto a private parking area, providing ample parking. Outside to the rear there is a paved patio area with raised decking to enjoy al-fresco entertaining. Additional patio adjoining and lawned garden bounded by timber fencing. SERVICES Mains electric, and drainage are believed to be available or connected to the property, heating by way of LPG, water by way of a meter. All services and appliances are not tested by the selling agent. DIRECTIONS From the Prestatyn office turn left and continue along Meliden Road and proceed through the village of Meliden to the traffic lights and turn left into Dyserth, proceed up Waterfall Road to the T-junction and turn left onto the High Street and the property will be found on the left hand side just before the doctors surgery.